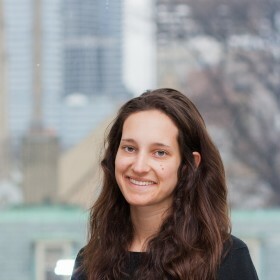 Amy Janzwood is a PhD candidate in Political Science and Environmental Studies at the University of Toronto. Her research broadly investigates how civil society actors interact with state and non-state actors in key areas of the political economy like energy, climate change, and trade. In her doctoral research — supervised by Dr. Steven Bernstein and Dr. Kate Neville — she studies the governance, evolution and outcomes of contested energy infrastructure projects in Canada. The Social Sciences and Humanities Research Council (SSHRC) Canada Graduate Scholarship supports this research. As a Research Associate at the Environmental Governance Lab, Amy analyzes the extent to which interventions that target corporations – such as carbon disclosure and carbon pricing – provide pathways to decarbonization. Amy’s research has been published by academic outlets like Global Justice and the Journal of World Trade, as well as by think tanks and non-profit organizations like the Canadian Centre for Policy Alternatives (CCPA), Global Policy (GP) Opinion, Canadian International Council (CIC), Council of Canadians, and the Centre for International Governance Innovation (CIGI). Amy holds a Master of Arts in Global Governance from the Balsillie School of International Affairs. Amy Janzwood, Scott Janzwood. Redrawing the battle lines in the fight over Canada’s price on carbon. OpenCanada. March 19, 2019. Amy Janzwood, Caitlin Scot. Will Science-Based Targets Save Us? Insights from the Global Food Industry. Global Policy Journal. February 5, 2019.